LE BOURGET, France -- For India, it all comes down to money. The world's fourth-largest greenhouse gas emitter plays perhaps the most pivotal role of all 196 countries at U.N. climate change negotiations here. With China now moving steadily toward taking serious responsibility for its skyrocketing emissions, all eyes are now on India to see how it will play its cards. Prime Minister Narendra Modi kicked things off in high gear, announcing a massive new solar alliance of 120 countries as well as the doubling of India's clean energy budget as part of a multibillion-dollar partnership spearheaded by Microsoft co-founder Bill Gates. That's beyond India's current goal of quadrupling its clean energy output to 175 gigawatts by 2022. Declaring the solar alliance "the sunrise of new hope," Modi declared that prosperity for the future of India and the world rests on boosting clean power to meet the energy needs of the poor. "Solar technology is evolving, costs are coming down and grid connectivity is improving," he said. "The dream of universal access to clean energy is becoming more real. This will be the foundation of the new economy of the new century." But the bold declarations mask a much more complicated positioning from India, which has made climate justice its rallying cry and opposes many of the key issues that climate change activists believe are needed for a strong agreement. Most prominently, it is fighting the creation of a system by which countries would review and tighten their greenhouse gas emissions targets every five years. India's negotiators also oppose a long-term goal calling for decarbonization by the end of the century, which business leaders deem critical for sending a signal to industry that clean energy is the future. India also continues to demand access to intellectual property rights to help it meet a series of ambitious clean energy goals, an issue of serious concern to U.S. business interests. Its leaders have also made clear that coal is and will continue to be a central part of India's development. "The prosperous still have a strong carbon footprint, but the world's billions at the bottom of the development ladder are seeking space to grow," Modi told leaders assembled here. Yet as negotiations get underway in earnest, it is becoming ever clearer what can bring India to the table. "There are more people in India without access to energy than there are people in this country," U.S. Climate Action Network Executive Director Keya Chatterjee said. "It becomes this diplomatic question of how do you get India what they need in order that they feel confident that they can do that [come to agreement] in the negotiations?" Harjeet Singh of ActionAid put it more bluntly: "I think if finance is equally factored in, India is completely on board." While the heart of the new climate agreement will be the targets, or intended nationally determined contributions (INDCs), that more than 180 countries have now submitted to the United Nations, finance is an equally large part of the equation. Developing countries insist that equation isn't yet adding up for them. India's Prime Minister, Narendra Modi, meets on the sidelines with President Obama at the opening of the Paris climate talks. Photo by Evan Vucci, courtesy of AP Images. At the 2009 climate summit in Copenhagen, Denmark, wealthy countries vowed to mobilize $100 billion in public and private dollars to help poorer countries transition to clean energy and protect themselves from the impacts of climate change. By some estimates, they're about two-thirds of the way to that goal, though some countries dismiss the study from the Organization for Economic Cooperation and Development on which those figures are based. Now countries want to see a pledge from rich nations that the $100 billion is just a start. That's something the United States and other wealthy nations have not yet been willing to promise, despite putting up billions of dollars in pledges over the past two days through the clean energy initiative with Gates and other initiatives. Activists, though, said those projects can't take the place of financial commitments from governments. "These good initiatives cannot and should not be used as bargaining chips here in Paris," said Lies Craeynest of Oxfam International. 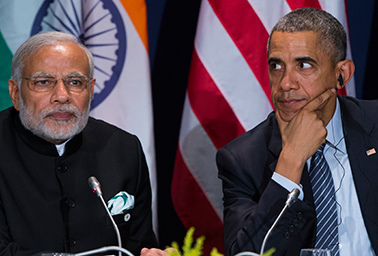 President Obama in meeting with Modi on the opening day of climate talks emphasized the spots the United States and India have in common, and declared that the Paris deal "must recognize and protect the ability of countries like India to pursue the priorities of development, growth and poverty eradication. "Our teams are working together to achieve those objectives," Obama said. But it promises to be a long week. Edward Cameron, managing director of We Mean Business, which represents industry leaders pushing for a five-year ratchet mechanism as well as a long-term goal of decarbonization well before the end of the century, said he believes India will ultimately come around on what he called "vital" issues. "We have had a conversation with the Indian government and multiple conversations with Indian businesses and NGOs," Cameron said recently. "There is a tendency in India for there to be an extremely vocal and contentious debate behind the scenes, but that conversation seems to shut down when those negotiations leave India and reach the international stage. They tend to close ranks around each other," he said. Still, Cameron maintained, "India will not block a deal. I think India will be more in the movable category and not in the blocker category." Bloomberg New Energy Finance's Michael Liebreich was less optimistic -- or, as he described himself, "slightly more cynical" -- about India's plans. He described India's solar target as ambitious but its coal plans as equally large, and declared India "the least helpful of all the major participants" in the climate talks. "I'd like to see them play a much more pioneering and innovative role," Liebreich said. "India has a huge role to play and doesn't seem to be where it could be." Or, as one negotiator added: "They've got to bring something home. They need a head on a platter." That head could come in the form of technology, something the United States is fighting hard. Ajai Malhotra, a former Indian ambassador to the United Nations, said he thinks the country's position on intellectual property rights has been taken out of context. "India is not looking for IP rights to be violated. Not at all. And nobody is saying that we want it for free," he said. Rather, Malhotra said, India wants to see funding through the Green Climate Fund or other mechanisms to help countries cover the incremental costs of patents for choosing clean energy over fossil fuels. "All we're saying is the terms don't have to be purely commercial only," he said. On other issues, though, India's fight isn't just with the big and powerful, but with smaller and more vulnerable countries that say they chafe at some of India's statements. "Your right to pull people out of poverty doesn't negate my right to survival," said one island negotiator who, like many in these talks, did not want to publicly criticize India because it relies on the nation for foreign aid as well as backing on other issues in the talks. Here in the U.N. tent city where negotiations are being held, Indian activists are busy explaining their country's position. "India is making efforts in striving to increase renewable energy to the maximum extent possible," said Sanjay Vashist, a spokesman for Climate Action Network South Asia. "Certainly, we hope that the Paris outcomes give us an instrument that can help us to achieve the challenges it faces ... and that we hope gives confidence to India to agree on a long-term goal sooner. But as of now, there are challenges." Singh said all countries have agreed to work toward a shared goal -- keeping global temperatures at safe levels -- but said it's important to realize that India is starting behind wealthier countries. "We have very different starting points on that line. We are standing at different locations. Finance is going to be the accelerator that can take us to that common finish line," he said.